In this step, we will be creating the background of our image, which would be a dark and mystical forest where the assassin will be attacking her target. To start, let’s open “Fantasy Forest Stock” by Moonchilde-Stock. Once it is open, just activate the Move tool by pressing V on your keyboard and once this tool is active, left-click on our open stock image and drag it to our canvas. Now, we will be enhancing the light on this forest background. To start, click on the background layer and then create a new layer by pressing Ctrl/Cmd + Shift + N and once the box opens, input “Light 1” on the name box. Next, create another new layer and put “Light 2” on the name box. When you’re done, select all the layers that you’ve created and press Ctrl/Cmd + G to group the layers. Once grouped, rename the layer to “Background”. Once you’ve created the selection area around the assassin, activate the Move tool (V) and drag the selected assassin to our canvas. Position it above the Background group by dragging it on top of it. Name this layer to “assassin”. Naming a layer is simple and similar to naming a group. Just double click on the words: “Layer 1” etc. and then a text box would appear and then you can name it. To remove that, we would need to activate the Polygonal Lasso Tool (L). Once activated, create a selection area around that remaining grass image from the “Southron Archer 4” image. Next, we would have to blur the edges since we need to create a realistic depth of field which was lost during the process of creating a selection area around the assassin and moving it to the canvas. Next, we will enhance the color of this image to make it blend with the background. Next, we will enhance the shadows on the assassin. To start, create a new layer (Ctrl/Cmd + Shift + N) and name it “Darken”. #: 000000 is the color black. Select all the layers that we’ve created for this step and press Ctrl/Cmd + G. Name this group to: “assassin”. In this step, we will be adding flames to the assassin’s arrow rendering it more deadly and efficient. To start, let’s create a new layer (Ctrl/Cmd + Shift + N) above the “assassin” group and name it “fire 1”. Next, create another layer (Ctrl/Cmd + Shift + N) and then name it “fire 2”. Now, we will be using the “Fire Brushes” by Skippy3E, so activate the Brush tool (B) and then right click on the canvas to activate the contextual menu. Once activated click on the drop down menu and click on Load Brushes. Once the Load Brushes option has been clicked, locate the “fire brushes” from the directory you’ve saved it into (as soon as you’ve downloaded it on the computer, its name will be changed to “assorted fire brushes by skippy3e”) and then click OK.
Now when you activate the contextual menu of the Brush tool (B), you’d see a bunch of fire brushes instead of the default circles. Next, create a new layer (Ctrl/Cmd + Shift + N) and name it “fire 3”. Next, create a new layer once again (Ctrl/Cmd + Shift + N) and name it “fire 4”. 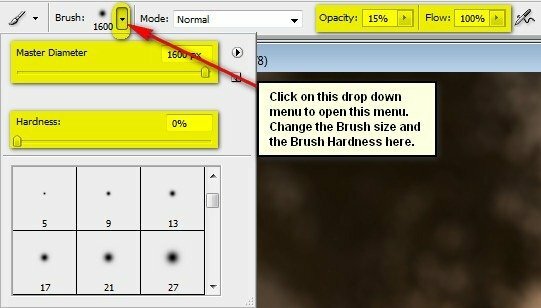 Activate the Brush tool (B), right click the canvas, hit the drop down menu and click on Reset Brushes because we will need to use the default circular brushes. Next, create a new layer and name it “fire 6”. Group all the layers we’ve created here (Ctrl/Cmd + G) and name this group to “Fire”. Next, create another layer and name it “Darken 2”. In this step, we will learn how to create a vignette which will help enhance the focus on our subject. To start, go to the Menu bar and click on File > New and use the same settings we used to create our canvas. (Refer to Step 1). Now, we will add textures to give the image an old and dark feel. To start, let’s open the stock image: “Grunge Texture 4” by darkrose 42 stock. Activate the Move tool (V) and drag that image to our canvas; put it above the Vignette. Now, we will be adding some adjustment filters to enhance the overall appearance of the image. To start, let’s create a Gradient Map adjustment layer by pressing the “Create New Fill/Adjustment layer button”. Next, click on the “Create New Fill/Adjustment layer button” once again and then Hue/Saturation. Next, create a Solid Color adjustment layer. Clicking the Solid Color option will open the Color Picker box. Once open, input the following on the #. Next, we will enhance the Exposure of our image. Click on the “Create New Fill/Adjustment layer button” and choose Exposure.